If you like Qwirkle, we hope you’ll try Qwirkle Cubes, the sequel to Qwirkle! MindWare	published Qwirkle Cubes in early 2009. Qwirkle Cubes has received awards from Doctor Toy and Major Fun. And in October 2009 Qwirkle Cubes received a Parents' Choice Recommended Award. 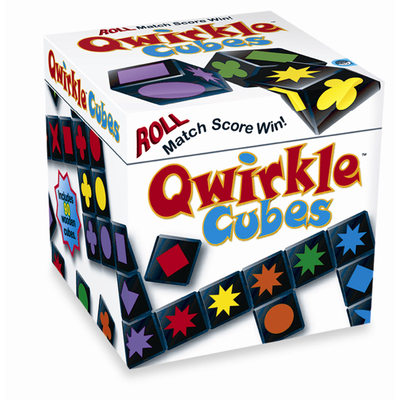 Qwirkle Cubes plays much like the original Qwirkle - players build color lines and shape lines - but Qwirkle Cubes gives you the potential to improve your hand every time you roll the cubes. 1)	Roll as many cubes from your hand as you want to. 2)	Play cubes from your hand to build color lines and shape lines. 3)	Draw and roll replacement cubes. Everyone plays open-handed, so players can better judge their opponents’ future moves. The game offers increasingly strategic scoring opportunities, as you decide which cubes to roll and which cubes to play. And be sure to look at Qwirkle Cubes Party for pictures from the Qwirkle Cubes release party.